Mississippi. When It Comes to Modern Medicine, We Wrote The Book. - Mississippi Believe It! Home » Resources » Campaign » Mississippi. When It Comes to Modern Medicine, We Wrote The Book. If you listen to “Hollywood,” Mississippi should be the last place to turn for learning anything about medicine. They couldn’t be more wrong. When it comes to modern medicine, Mississippi wrote the book. Literally. 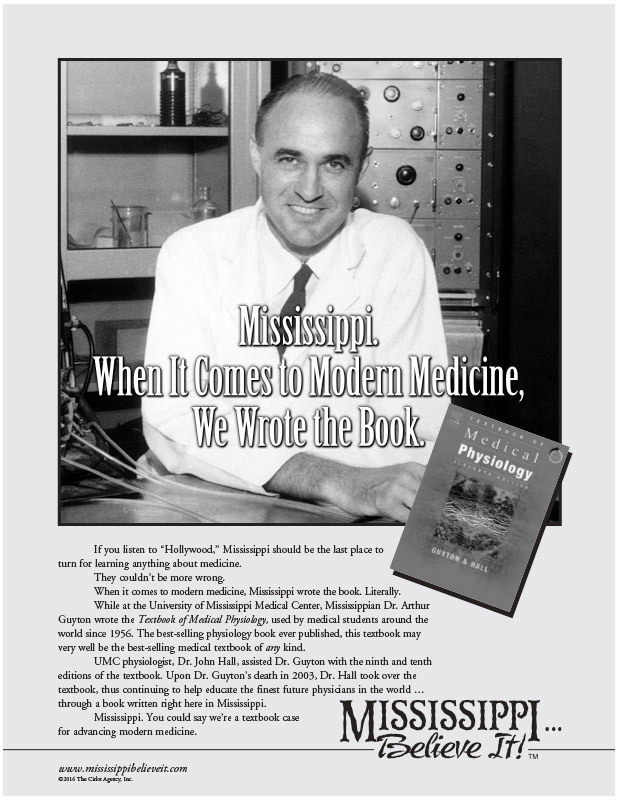 While at the University of Mississippi Medical Center, Mississippian Dr. Arthur Guyton wrote the Textbook of Medical Physiology, used by medical students around the world since 1956. The best-selling physiology book ever published, this textbook may very well be the best-selling medical textbook of any kind. UMC physiologist, Dr. John Hall, assisted Dr. Guyton with the ninth and tenth editions of the textbook. Upon Dr. Guyton’s death in 2003, Dr. Hall took over the textbook, thus continuing to help educate the finest future physicians in the world … through a book written right here in Mississippi. Mississippi. You could say we’re a textbook case for advancing modern medicine.